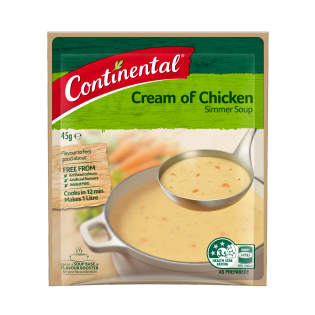 Try Continental Cream of Chicken Simmer Soup for a tasty snack and meal, or try one of our great recipes with it, like our Creamy Chicken & Bacon Pasta bake! Sorry Mary, but we've had a look & we can't seem to find the recipe you are looking for. I was just wanting to know, two things..A. Why cant we get cream of mushroom in thEse soups, now? B. Does cream if chicken has actual chicken in it or is it a vegetable chicken flavouring? Thank you. Hi Lorraine, sadly our Cream of Mushroom Simmer Soup has been deleted for a while now. As for our Cream of Chicken Simmer Soup., it contains chicken powder. Give us a call at 1800 888 997 if you have any other queries. Lack of supply of low salt cream of chicken soup, or low salt soups needs to be addRessed. With the increase of heart disease, obesity Etc. perhaps loWering the salt content of all soups May be the way to go. The public dont need to know! !